Four Color Zack is a scratch champion and technical innovator. DJ Scene is a clubland institution from Miami to Vegas and beyond. These two “real DJing” vets understand party music like none other, and it shows all throughout their Slap It Down EP. Featuring amped-up guest vocals from M.O.P. 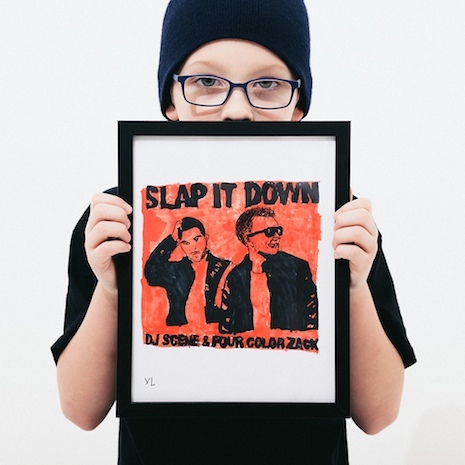 and Mad Lion, Slap It Down lays classic hip-hop party break vibes over modern-day dance muscle, resulting in a stoopidly fun listen for all ages (word to FCZ and Scene’s 8 year old Seattle neighbor Yung Lenox getting busy on the cover artwork).